Continuing with the example in the previous post, let's see how we can use Visual Studio 2005 to create a .cab installer which will register the assemblies in the GAC. Open the File System Editor (it could be already open) pushing the button on the Solution Explorer toolbar. 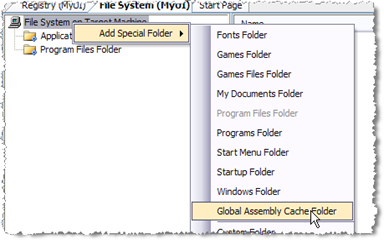 Create a new "Global Assembly Cache" folder on the file system editor: Right Click on "File System on Target" - "Add Special Folder" - "Global Assembly Cache Folder"
Now, you have both files on the GAC Folder. You just need to build the .cab project. When the .cab is installed on the device, all the assemblies and the .gac file will be placed on the "\Windows" folder. The next time a .Net CF application is launched, the assemblies will be registered in the GAC. If you uninstall the .cab from the device (i.e. using the "Remove Programs" option), the .gac file will be removed and the next time a .Net CF app is launched the also assemblies will be removed from the GAC, as we've seen in my previous post. It's just very simple! isn't it? I have a doubt you to help me. I created one .CAB for my project and worked perfectly, but every time I change the battery or need to reboot smart device, the application is lost. How do to keep the application in the smart device? Congratulations on BLOG has been very useful to me. It looks like you've a Pocket PC running a WM version prior to Windows Mobile 5. Persistent Storage is new for Pocket PC from WM5 (but it's included in all the smartphone versions). The only alternative you have is to install your app into a storage card (CF, SD, etc). Thanks for your feedback! I have a similar problem as Marcio. My application stays installed after changing the battery, because my mobile device has a "backup" function which backups /Windows into /Backup/Windows. On Cold reboot, the device copies the /Backup/Windows folder back to the regular /Windows folder. Now, the problem is that somehow the .NET framework 3.5 and (I think) SQL Server CE 3.5 are lost after such a cold reboot. I wonder if any of your blog posts could be used to solve this problem? I can't work with CF cards or images on the device. It's a Datalogic Skorpio Scanner with windows CE 5.0. The problem is with the third party software I am referencing (Franson Bluetools). When I create a new 'hello world' project without the reference the cab builds fine, when I include the reference I get the original error. 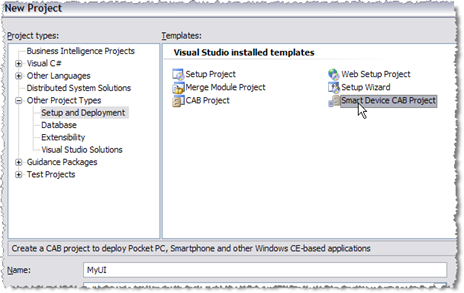 The funny thing is that when I deploy app with the included reference with vs2008 it works as it should, there is only a problem when I try to create a cab file. Are there any precautions when referencing a non microsoft dll? This is a very common scenario, and you can follow several approaches according to your needs. Setup.dll Sample and Walkthrough: Terms & Conditions / End User License Agreement for a Smart Device CAB installer for understanding what is a Setup.dll and how you can build one. onto a mobile 6 pda? This is the file the attempts to load to the device when deploying from visual studio but when I do this and also from a setup file the installation in both cases is unsuccessful. Is there any way I can customize my cab to install particular files on a specific device while other files on a different device, while using the same cab file for installation on both the devices.